“Nikko™” is part of the exciting series of mice celebrating the 75th Anniversary of the classic 1939 motion picture The Wizard of Oz™. 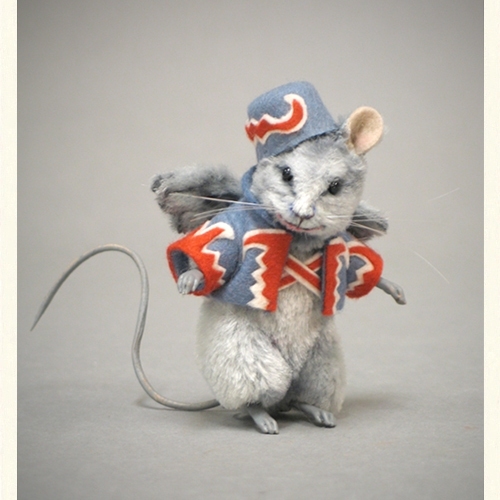 Brought to life for the first time in the form of a mouse, Nikko – the leader of the Wicked Witch’s Flying Monkeys – is made of custom-dyed mohair plush with hand painted features, resin hands and feet, glass eyes, inset whiskers, and a leather tail. Measuring just 2 3/4″ tall, a built-in metal stand provides effortless display. Nikko comes authentically costumed in a felt jacket with a short cape embellished with an applied felt applique pattern. Corresponding felt strips cross his chest and wrap to the back and a matching cap sits over one ear. Detailed wings made of alpaca ‘feathers’ identify Nikko as the leader of the fearsome Flying Monkeys! The R. John Wright Wizard of Oz Mouse Series is officially licensed by Warner Brothers.